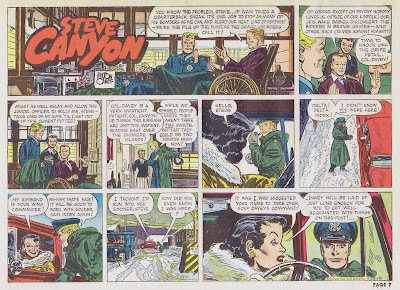 Milton Caniff of Terry and the Pirates and Steve Canyon was one of the all time cartooning greats. 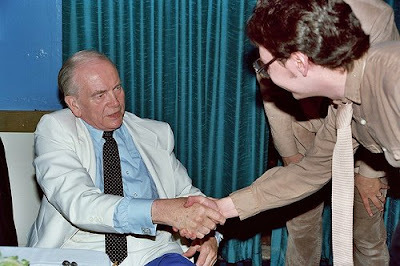 Here's a pic of me meeting the man back at the 1982 San Diego Comic Con (photo by Alan Light). 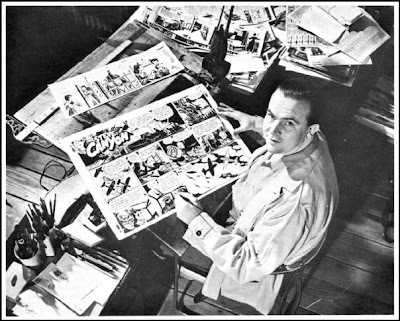 Below is a classic publicity shot of a younger Milt, working on a Steve Canyon Sunday page. The strip samples shown are a Terry from '35 and a Canyon from '54. If you'd like to see more of Milt's work on line, check THIS. If you're a serious comics fan, you should make room on your bookshelves for IDW's wonderful six volume Complete Terry and the Pirates -- available from various booksellers. 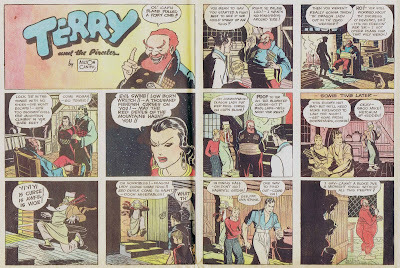 My posts about vintage comic strips continue, as we lead up to the publication of Big Funny!